San Juan Women's Association, Sohoton Service Cooperative, NASAKASECO, BABAMACO, and KAPAWASECO are the people’s organizations who participated in the ASEAN – inspired module of tour guiding; the roles, functions, responsibilities, types, identification and characteristics of a tour guide and tips on a walking tour. Representatives of BK Samar-Leyte eco-tourism sites attentively listen to Marisa Alcantara of Pirkko & Troy’s Tours, Inc during the basic tour guiding training. 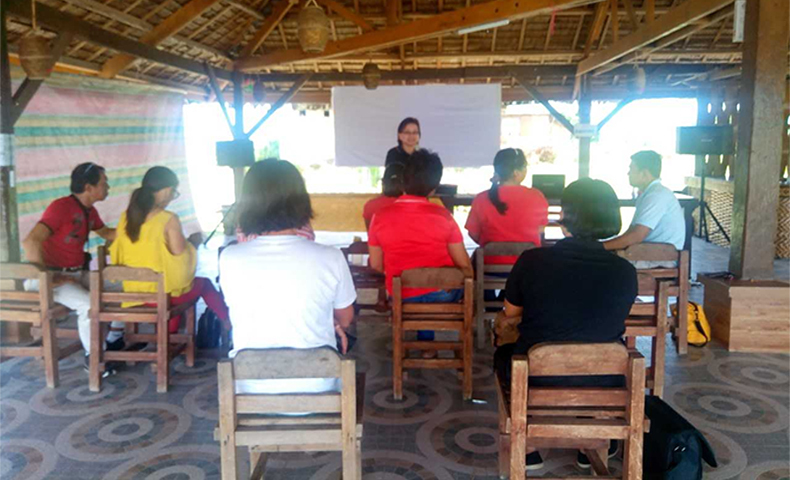 With the assistance of ABS-CBN Lingkod Kapamilya Foundation, Inc.'s Operation Sagip and Bantay Kalikasan, the said POs and COOPs are now managing different eco-tourism sites in Samar and Leyte. These sites now receive thousands of local and foreign tourists annually. As the Tour Guding Training is based on the ASEAN module, it gives a great possibility that the local communities’ tourism service will be at par with the neighboring ASEAN countries’. The province of Samar and Leyte are two among those that were greatly affected by Typhoon Yolanda (Haiyan) last 2013.